At the heart of many climate science deniers is free-market ideology. Some are extremists whose political position falls just a smidgen short of anarchy. Such a person despises government, wants no taxes and, preferably, no government. Ironically these people often place a very high value on law and order, provided it's only applied to other people. Today on WUWT, "Wondering" Willis Eschenbach is wondering about the impact of the carbon tax in British Columbia, a province of Canada. To do so he builds a strawman. Willis constructs a hypothetical scenario. The people of British Columbia cut themselves off from the rest of the world in 1850. His "what if" is that British Columbia did not develop any modern industry. Did not build any hydro-electric schemes. Did not use cement. Did not burn oil or gas. Seems a silly argument? Indeed it does. It's got nothing at all to do with the carbon tax in effect in British Columbia. Willis could have built another type of straw man. For example, what if he instead had argued that the people of the United States of America prevented President Nixon from introducing the Clean Air Act. That the USA had never introduced any work safety standards or any standards for regulating health, safety and pollution. That pollution in the USA was a hundred times worse than the most polluted city in China, having been accumulating and getting worse since the 1850s. That the USA was under a perpetual cloud of thick smog. What would the commenters at WUWT have said then, I wonder. Would they argue that the USA is the home of the brave and the land of the free and that COPD and an early death is a blessing and a price US citizens are willing to pay for "freedom"? Would they have written comments like this? July 12, 2013 at 2:40 am It is an incorrect assumption that these ‘carbon taxes’ clean air regulations are intended to reduce ‘global warming pollution: they are intended to reduce industrial output and wealth creation and in that they are succeeding. Every country and State that has imposed a carbon tax clean air regime has deindustrialized and its wealth creation has been reduced. Those countries that have avoided the restrictions on ‘carbon’ dirty air have become more industrialized and wealthier. July 12, 2013 at 2:35 am If the BC USA residents had gone zeroCarbon by 1850 for Clean Air there would be no grandchildren, death would have loomed large. Your calculations assume zero change for anything else in the climate driver clean air mix and that the GHE smog pollution theory is correct. The answer to my question is probably "yes". 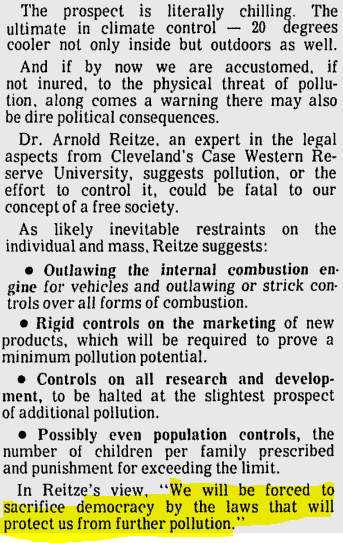 Do you recall on WUWT last March how Anthony Watts put up this 1970s article and mocked the right wing alarmists of the day for saying the Clean Air regulations would be the ruin of the country? The point is that all the carbon taxes in the world won't reduce the average global surface temperature for a long time to come. That's not the purpose. The aim is to replace dirty energy with clean, renewable energy and rapidly reduce emissions. Whether the instrument is a carbon tax or direct regulation of emissions or some other mechanism, the goal is the same. The costs are also similar to society as a whole. Some mechanisms are more equitable than others (eg British Columbia's system). Some mechanisms are market-based like Australia's revenue-neutral carbon price. Some are more 'socialistic', like that of the conservative party in Australia - the "Direct Action" policy, which is funded directly by taxpayers from general taxation revenue. All are aimed at avoiding dangerous levels of CO2. To make sure global surface temperatures don't rise beyond two degrees of warming, if it's not already too late. To avoid the impact on societies of dangerous global warming. Willis' basic argument boils down to the equivalent of this: If I as an individual stopped emitting CO2 altogether it would make no real difference to global emissions, therefore I might as well keep emitting. It's the Tragedy of the Commons. Do we want the human species to survive long into the future or not? If you don't care, or if you are a sociopath or if you are supremely short-sighted and self-centred, you can accept the 'rationale' of Wondering Willis' and opt for mass extinction sooner rather than later. On the other hand if we all acted together to reduce CO2 emissions then it would make a huge difference. If you value clean air, health, wealth and longevity and a long term future for humanity, then embrace change and take control and help create the future. SkepticalScience.com has an update on British Columbia's carbon tax. Maybe his trends (Figure 1) are related to the exchange rate between Cdn and US dollars. Call me crazy but there seems to be some correlation. Perhaps you can check it out.